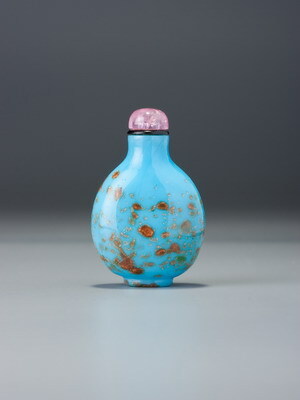 This is one of a series of bottles of purse or pouch form based on the popular belt-purses worn as part of Qing official paraphernalia. This example is well carved and hollowed, and also appears to have been made originally in this form. 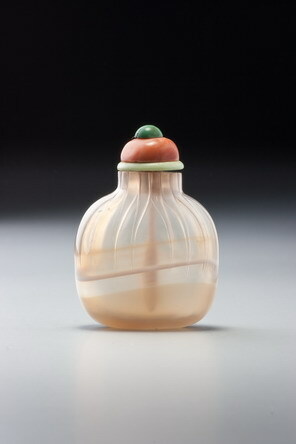 In recent years, old plain agate and chalcedony bottles have been re-carved in China and Hong Kong to make them more saleable. Among them is a series of pleated purses of this type. This example is unusual in the manner in which the pleats have been carved. No. 239 represents the standard way of pleating the shoulders for a hardstone simulation of a purse, with a series of channels carved vertically from the neck to about the mid-way point of the body where they peter out to blend with the plain surface of the lower area. Here the process is quite the opposite and more painstaking. A series of raised pleats has been left in relief and then the larger gaps between them have been scalloped out with concave curves. Both peter out at about the same point, but it is a quite different idea of arriving at a similar visual effect. This example is also unusually small for the shape, the standard being closer to no. 239. Bottles of this form appear to have been made by the Official School, possibly at the court workshops, but they may also have been made elsewhere as we believe that the Official School represents a genre of bottle made in a variety of different workshops rather than a group produced by a single workshop (see discussion under no. 258). There is an example of this form in banded agate in the Imperial collection (Gugong bowuyuan 1995, no. 138). For a portrait of an official wearing pouches and taking snuff from a bottle held in his hand, see Snuff Bottles of the Ch’ing Dynasty, front cover).